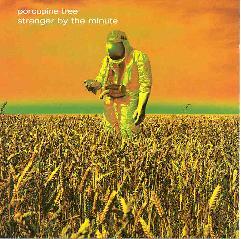 Porcupine Tree - "Stranger By The Minute"
This CD single has two audio tracks - "Stranger By The Minute (Edit)" and "Even Less (part 2)" - and a video of "Piano Lessons" you can play on your computer. The video is cool though I don't see myself watching it more than once. But at the end it's got a menu where you can access some photos, a discography, lyrics to the three tracks, and a list of web page links. "Stranger By The Minute", though an "edit", is essentially the same track as on the album. What makes this worth the price of admission is "Even Less (part 2)". It starts as a heavy psych freakout instrumental that rocks hard and has some great screaming guitar from Wilson. Gorgeous! The music soon settles down into an acoustic song that eventually launches into the familiar "Even Less" from the album. The production on this version is much rawer than on the album but seems to be intentionally so and sounds pretty good all the same. Of interest to Porcupine Tree completists and those of us who never tire of Wilson's guitar work.